Weight loss is very difficult to achieve for most of us. Although the formula for losing weight is well known and quite simple, weight loss is not an easy goal to achieve. If you eat fewer calories and burn more energy then you should lose weight. In other words, you have to expend more energy than you obtain from eating. Since sticking to a diet or exercise routine is difficult for most of us and since we are addicted to our iPhones and other mobile devices it makes sense to combine weight loss apps with other strategies for losing weight and improving health and fitness. A recent study reviewed 28,905 apps for weight management and found that 34% targeted physical activity, 31% targeted diet, and 23% were used for monitoring exercise, calorie intake, and body weight. Although the following apps will not stop you from eating that juicy piece of cake, studies have shown that apps are modestly effective for improving healthy behaviors. Here are three top iPhone apps that will help you reach your weight loss goals and improve your overall fitness and health. While these apps were designed for earlier iPhone models, updates that take advantage of the operating system and other features of the new iPhone 8 and iPhone X will increase the usefulness of these apps. Nike Training Club is developed by Nike and it is free. It has a 4+ rating in the app store. Nike describes it as the ultimate personal trainer. Users can select from over 160 workouts for strength and endurance to mobility and yoga. MyFitnessPal is developed by Under Armour. The basic version is free and it has a 4+ rating in the app store. 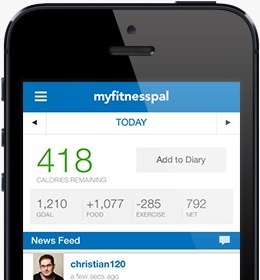 MyFitnessPal is a calorie counter that has a database of over 6 million foods. You can set a daily calorie goal, record your food consumption, and track your exercise to help you reach your weight loss goal. You can scan foods with the barcode scanner. Fitbit Coach is a free digital personal trainer that has a 4+ rating in the app store. Use this app to create a custom workout based on your fitness level. The app has personalized video workouts that provide step-by-step coaching, motivation, and tips to help you reach your goal. It is compatible with the Fitbit and it will recommend workouts based on daily activity tracked by the Fitbit. Outfit your iPhone with unique kickass phone Cases from Society6. Deck out your mobile in sheath designed by artistic geniuses. Because your cell should always look as fresh as you do.